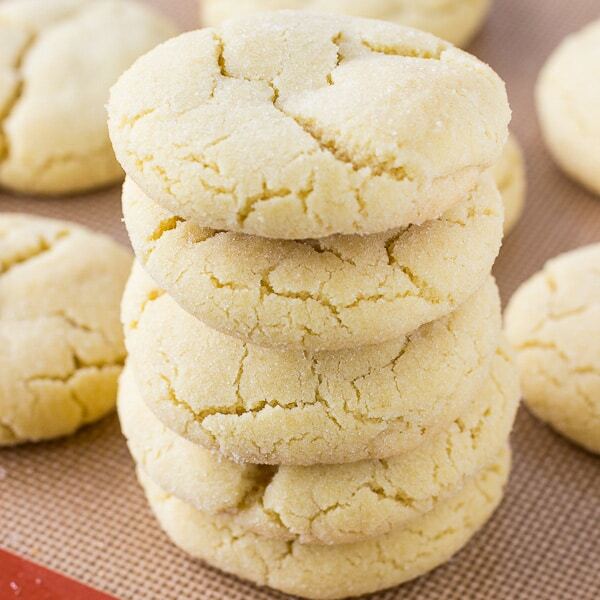 If you are craving a cookie to knock your socks off, look no further than these Soft Sugar Cookies. They seriously are the BEST sugar cookies around! I love a good cookie. Depending on what type of cookie it is, the textures of it needs to vary. For chocolate chip cookies, I like them ooey gooey soft. For oatmeal cookies, I prefer them thin and crisp. But for these sugar cookies? I honestly love them either way! With the holidays coming up, there’s no better time than now to perfect your sugar cookie baking skills. This recipe will have you baking like a pro in no time and you’ll be granted the title “cookie queen/king” as well. Wow your friends and family this season by bringing a plate, or two of these delicious sugar cookies to the next family function. As soon as you set the plate down on the table, hands will be grabbing them left and right! Bake an extra batch and leave them at home for you to enjoy later! ● BAKING SODA: 3/4 teaspoon baking soda. Make sure your baking soda is no more than 3 months old. If your using old baking soda, the cookies won’t rise properly and will be FLAT. ● SALTED BUTTER: 1 cup ( 2 sticks) of salted butter. If you don’t have salted butter, I would add about 1/2-1 teaspoon of salt. Also, make sure your butter is at room temperature. If your butter is TOO WARM, it will also result in cookies that will SPREAD. So the best thing to do is let the butter sit out on the counter for at least 1 hour before you start baking and it will be perfect! STEP 1: Whisk together the flour, baking soda, and baking powder in a medium-size bowl. Set aside. 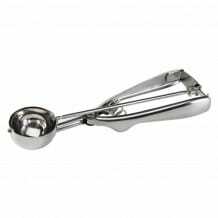 STEP 5: Using a cookie scoop or ice cream scoop, scoop dough into balls about 2 Tablespoons each, roll in sugar and place onto prepared baking sheet. STEP 6: Bake for 10-15 minutes or until tops of cookies start to crack. Let cool for 5 minutes on baking sheet before moving them to a wire rack. Let cool completely on wire rack. 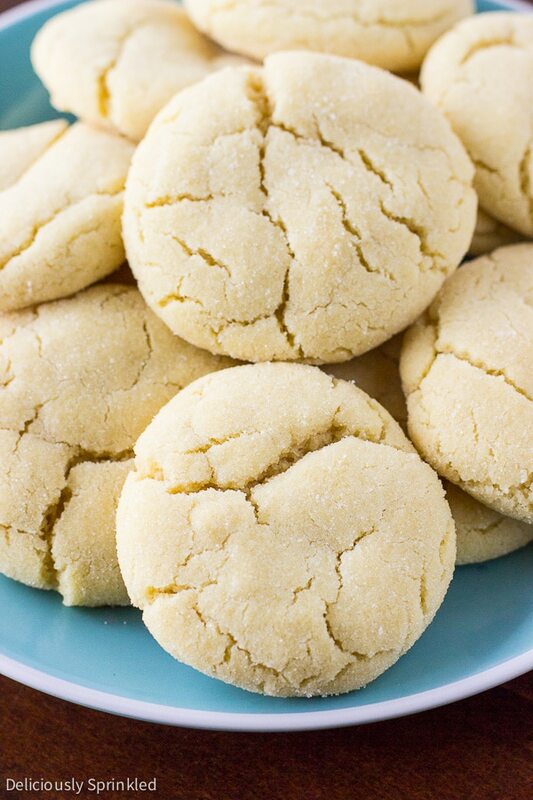 The BEST soft sugar cookies, melt in your mouth goodness that you literally can’t stop eating! 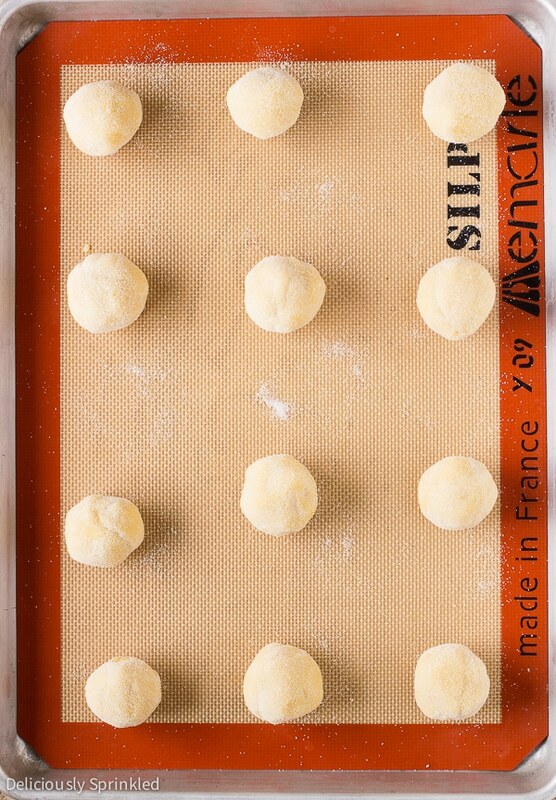 Using a cookie scoop or ice cream scoop, scoop dough into balls about 2 Tablespoons each, roll in sugar and place onto prepared baking sheet. Bake for 10-15 minutes or until tops of cookies start to crack. Let cool for 5 minutes on baking sheet before moving them to a wire rack. Let cool completely on wire rack. STORE: Cookies will stay fresh for up to 7 days in an airtight container, stored at room temperature. FREEZING: Roll the dough into balls and place them in an airtight container. You can freeze the cookie dough for up to 2 months. To bake, place frozen cookie dough balls onto prepared baking sheet and bake for 15 minutes. I doubled this recipe to send to a party and left a dozen at home. That was the best tip! These are AMAZING. I can’t wait to make them again. Thank you so much for this recipe! Are these still tasty if they arent rolled in sugar? Some of my family members do not like things that are too sugary. Yes, they would taste fine without the rolling them in sugar! Question, are these good for cookie cutters or am I better off using another recipe? thank you! Can you bake these from frozen, or should I thaw them first? I’m planning cookie trays for Christmas and am mixing/freezing dough to bake later. I pre rolled them into balls! Also, I added fresh cranberries, and the one I tested was amazing. I’m going to make orange zest frosting to top them off. Yes, you can bake them when frozen. They might take a couple minutes longer to bake. And adding cranberries with a orange frosting sounds AMAZING! Enjoy and Merry Christmas! Can you double this recipe or is it better to make two batches? Help! These are my favorite sugar cookies and I don’t see the butter listed in the recipe. What happened to the butter? I need this recipe before the holidays. I hope you’re still reading the comments here! Thanks so much for bringing this to my attention! My website was recently updated and some of my recipes did not transfer over correctly. I’m in the process of going through ALL my recipes to make sure they are correct. So I appreciate you bringing this to my attention so I can fix the recipe ASAP!!! Loving all the tips and tricks to getting these perfect! I’ll be making a batch (or two or three) today!! These cookies are pillowy and perfect – so chewy, easy, and dreamy! These are my new go-to! These cookies sound amazing!! My kids would LOVE them! Our GO TO sugar cookie recipe! These look perfectly pillowy and delicious! 5 STARS!! I love my sugar cookies soft and fluffy, I wish I found this recipe years ago. I halved the recipe, & did not realize until writing this, that I still used 3 yolks instead of 1.5! Yet the cookies still came out so fluffy & melt in your mouth! So if you’re halving this, I think it’s safe to say you can use 2 egg yolks rather than go through the hassle of using half a yolk – LOL. I didn’t roll in sugar as I use frosting for mine. I literally can’t stop eating them! I wish I made the full batch now! A trick I use when mixing the dry ingredients with the wet is using a spatula. Even though it takes more work and time it really helps to make sure you don’t over mix the dough. Thanks for the recipe it was delicious! Can you make this recipe with a sugar subitute for dietbetics?? I can not believe I just made cookies that taste this good! Seriously the BEST sugar cookie recipe I’ve ever tried. These are awesome. Thank you so much! 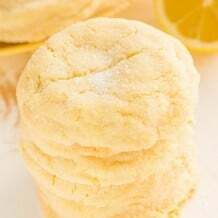 Can I use this recipe to make Lemon Sugar Cookies? If so, how much lemon extract or lemon zest should I use? Thank you. Can i use the whole egg or yolk only? Made a batch this evening and WOW. We are adding this to our recipe box. So yummy and fluffy. I made these last night because I had a craving. I rolled half in a cinnamon / sugar combo for snickerdoodles. 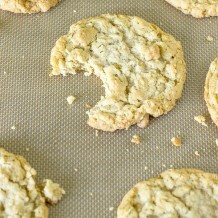 These cookies are so amazing I’m making another batch tonight with lemon flavoring. I love this recipe! I tried these for a girls Bible study early one morning. It was quick and easy and we tried them with cookie cutters. Great idea for needing a yummy great quick! Just made these! So amazing! Great recipe! No worries, you can add about 1/2 teaspoon of salt. A quick question! Do they come out soft or hard like crumbly?? I would like my cookie to be super soft, so how does this recipe come out? Or what should I add to make it soft? THANKS. I didn’t think a good sugar cookie recipe existed and most of them end up in the trash…Until I found this one. Holy cow, these are absolute perfection!!! So easy, and delicious. You have made this 8.5 month preggo very happy. I ate 3 in a row. Must….stop…. Made these for our anniversary. My husband loved them! Thanks for the recipe! These are absolutely splendid! Although I did use .5 cup butter and .5 cup margarine (I had not thawed another stick of butter) . They came out perfect! I will definitely be using this recipie again :-D.
How well do they freeze and defrost? WOW, Making these now and they are wonderful!! Perfectly cracked on top. I have tried many sugar cookie recipes, but my quest is over. This is THE sugar cookie for me! Thank you for sharing this recipe! Perfect!!!!! 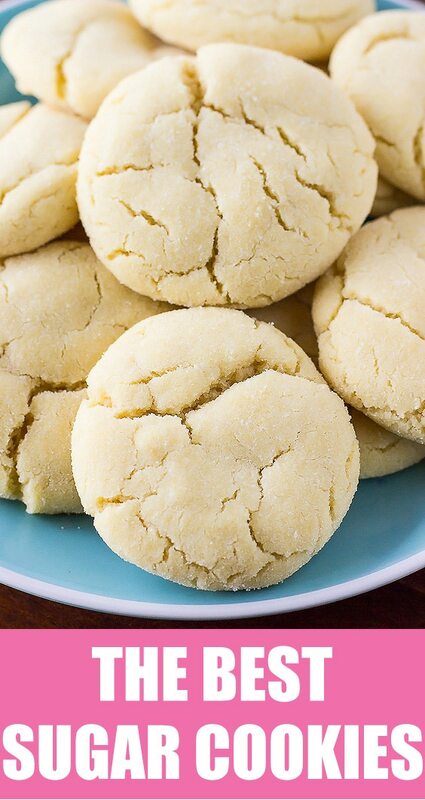 Can you freeze these soft sugar cookies once they are baked? Yes, you can freeze them up to 2 months. Just make sure the cookies are COMPLETLY cooled before you put them in the freezer. This recipe is so great! It was easy to make and the cookies taste amazing! I love them and my family loves them! This recipe is so good and it looks cool as iam about too make them with my family nefuw and niece when they get out off school for their afternoon snack slash evening snack I love baking when it comes too it as well baking can be my fravortie as well . Where did I go wrong…I followed the recipe to the exact details… I found the mixture hard to mix. The balls were hard to make , the mixture was falling out of my hands. Hopefully my efforts with these cookies won’t end up in the garbage. If the mixture is hard to mix, that might mean that your butter wasn’t soft enough. If the butter is too cold it will not evenly mix into the dough causing the dough to be dry/crumbly. 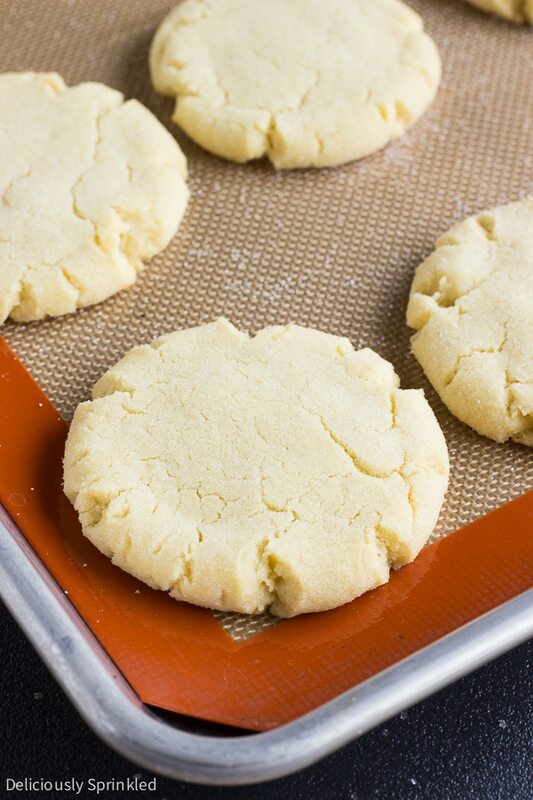 This is the best sugar cookie recipe on the internet. I have tried many that turned out pretty gross. Not these, every time I make these they come out perfect. Thank you for sharing these. Sugar cookies are my favorite cookies and now I can make them whenever I want. Ok.. 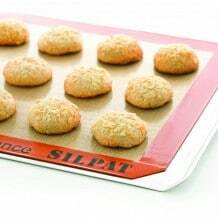 I have no parchment Or silicone baking mats.. Will these stick to an ungreased baking sheet? Yes, the cookies with stick to a I greased cookie sheet. 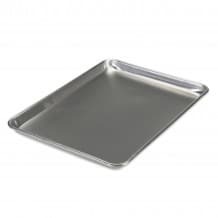 I would spray your cookie sheet with non-stick cooking spray. After you roll the sugar cookie ball in sugar, do you press the cookie into the hockey puck shape and then bake? Or do you leave them in the ball shape? What if i use unsalted butter? These cookies are perfect. PERFECT. I’m not even interested in trying any other sugar cookie recipes. Thank you! Can these be made with jam in the middle? should these be rolled in sugar after being cooled, or before baking? Wow! These turned out just amazing. Although I did not use an electric beater, just put together a few forks and beat it up. These are my family’s all time favorite! I can’t wait to share these with two families from my church tonight to accompany a dinner I am delivering. The ULTIMATE comfort cookie. They fly off the plate when I make them! Thank you so much. These are hands down the best sugar cookies I have ever had. I do a lot of baking and I hold my cookies to a high standard, and these certainly upheld my expectations. They are buttery, light, chewy, and super flavorful. They are so good they don’t even need to be frosted. 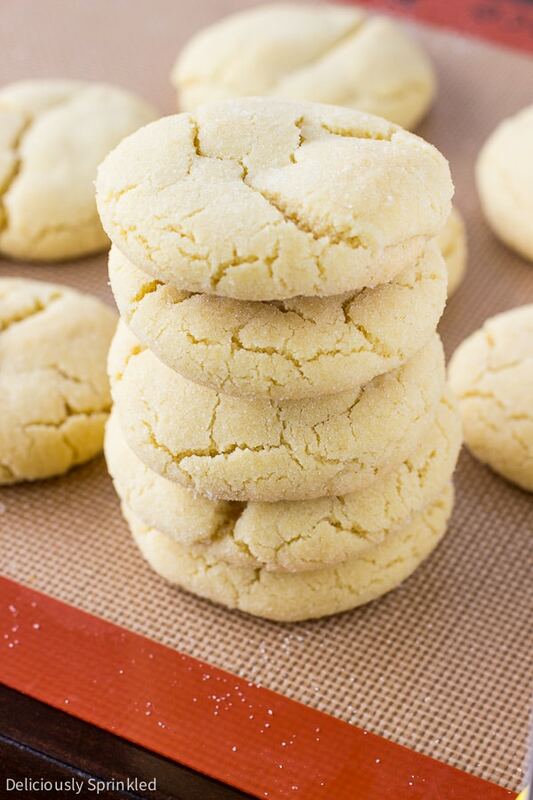 The perfect sugar cookie recipe! Can I still roll these out and use cookie cutters? No, these are drop cookies. 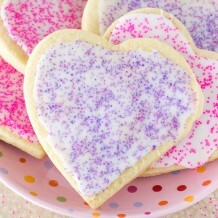 Here is my recipe for cut-out sugar cookies….https://deliciouslysprinkled.com/cut-sugar-cookies/! Omg! I am not a master baker, it’s much more finicky than cooking. I tried several other sugar cookie recipes before I found this one. I DID IT!!! They are a true sugar cookie in my opinion. They are just what I needed for my sons’ s cookie station for his birthday party! Thanks from me & my tummy! Made these to feed my monthly beast(PMS) and they hit the spot! Sweet and FLUFFY! just what I was craving. Just enough butter to be melt in your mouth and even though I left off the additional sugar coating it was sweet enough to do the job. Thank you for the simple recipe! Tried this recipe with white chocolate chips and craisins, it turned out AMAZING. 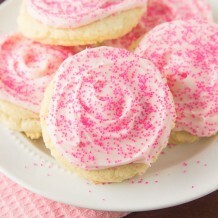 Definitely the best sugar cookie recipe ever!! I just made these. So delicious! I’m so glad you said to start checking at 12 minutes because mine were definitely done then. So easy especially since there is no chilling & rolling out. Very flavorful! Thank you for the recipe! These cookies came out perfect! Soft, puffy, not overly sweet, perfect! Thank you!! I did a 1/2 of this recipe as I was really juat wanting a cookie lol. I used unsalted butter and added 1/4 tsp of salt and I am moving and my vanilla is at the other place so I used the same amount of maple syrup in its place. These taste great!! They are not overly sweet like most sugar cookies. The buttery flavor comes through nicely! Mine dont look plump and adorable like yours but thats okay ;). Baked ’em and LOVED ‘EM!!! Easy peeezy n oh so delicious! These DO look absolutely perfect Jenn! All that pretty sugar on top has me swooning. I’m guessing the Super Bowl is probably another one of your “excuses” to make them, and I so wish I could be there to try one! 🙂 Pinned! You can’t go wrong with sugar cookies! Yum! Ohhh I bet these just melt in your mouth! They look to die for! These cookies look absolutely wonderful! Covered with some delicious frosting, I would love to sink my teeth into one right now! 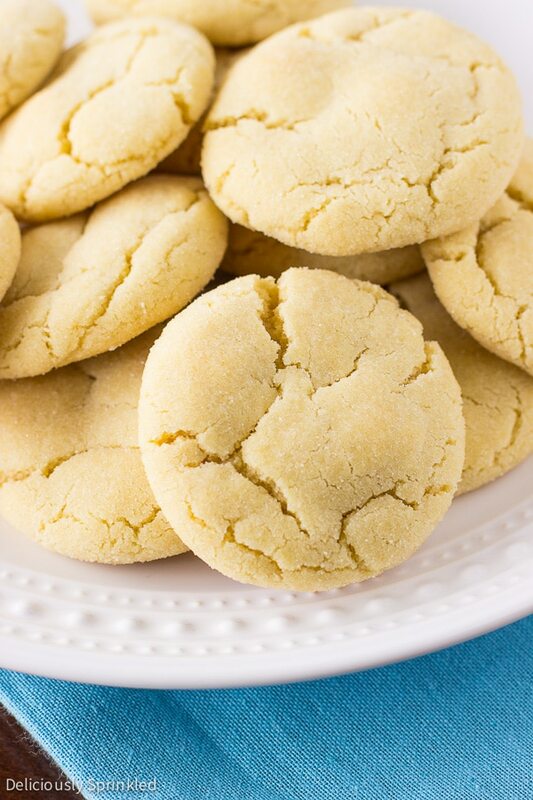 Everyone needs a perfect sugar cookie recipe in their arsenal, and these look perfect! You should name these = Pillow of ultimate bliss! Soft sugar cookies are the comfort food of desserts, aren’t they? These look amazing. Thanks for sharing! These look marvelous. I love that you don’t have to roll the out! Oooh, I love soft sugar cookies. They look amazing! When I saw these on Instagram, I had to head over and see what they were all about. They look insanely amazing! 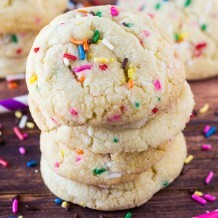 These are seriously the most delicious looking sugar cookies I’ve ever seen! My oldest’s favorite cookies are sugar cookies just like these. Totally going to make these for him – pinned! 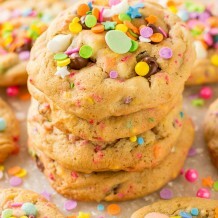 These look like fluffy pillows of cookie love! Beautiful pix! I love sugar cookies! These look just perfect!